South-East Asia is one of the world’s most dynamic economic regions. Consequently, its energy demand is soaring. The search for cost-effective alternatives to conventional energy sources is becoming increasingly important. Environmental and climate change concerns are reinforcing this development. As a result, renewables are rapidly gaining ground. Renewable energy technologies are synonymous with reliability, low energy costs in the long term, and reducing pressure on the environment. The potential for technologies such as biomass, biogas, solar and wind energy is high in the South-East Asian region; German renewable energy companies have broad experience and offer top-quality products and services. Therefore, the “German Energy Solutions Initiative” of the German Federal Ministry for Economic Affairs and Energy (BMWi) brings together the two sides to promote renewable energy and energy efficiency in the region. BMWi has commissioned the German-Bilateral Chambers of Commerce (AHKs) and the Deutsche Gesellschaft für Internationale Zusammenarbeit (GIZ) GmbH to jointly implement the initiatives’ regional activities. Within GIZ, the activities are carries out by the Project Development Programme (PDP) in Thailand, Viet Nam and Myanmar. 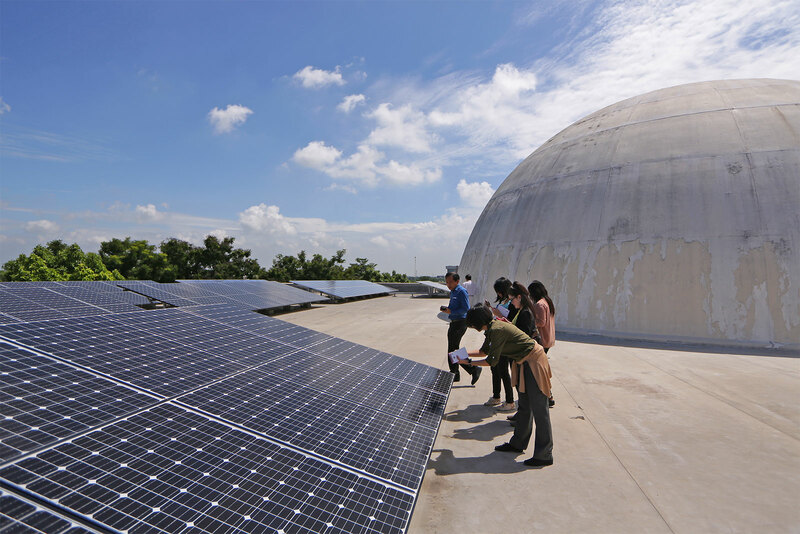 In Thailand, the team of the Project Development Programme supports the Ministry of Energy (MoE) in increasing the deployment of renewable energy technologies in the country. Thailand has ambitious policy targets for renewable energy and is the market leader for such technologies in South-East Asia. Under the current political framework, several initiatives focus on the community level with the goal to promote sustainable energy production on a decentralized level. In accordance with MoE’s goals, GIZ focusses on increasing the deployment of renewable energy in communities, regions and provinces in Thailand by sharing German experience and know-how. Since especially small and medium sized companies are the carrier of knowledge and technology in this regard, the strategy of the project is to trigger business cooperation between German and Thai companies, while allowing local communities to directly profit from renewable energy projects. It is the aim of PDP to support developing a Thai-German Community-Based Renewable Energy (CBRE) project jointly with MoE. In Germany, communities play an important role for the development of renewable energy projects. Over 900 energy cooperatives are currently active in Germany owning a total of 700 MW installed capacity. Sharing such experiences with Thai communities will make them more aware of the benefits of local energy production. PDP will furthermore aim to initiate a CBRE reference project where German companies share technology and knowledge with Thai companies. The aim is to combine different renewable energy or intelligent grid technologies and develop business models which allow for the local community to directly benefit from the project.